Is it your wedding soon and you are looking for the perfect ring? Or is it your mother’s birthday and you want to present her with a mothers ring? Whatever it is our guide to Italian gold rings gives you the facts & information you want to know. Promise Rings: They are thought to be pre-engagement rings. If you are sure about your future partner but are not ready to marry yet, then promise rings are your ideal choice. Engagement Rings: Wonderful designs to ask someone to marry you. Wedding Bands: Wedding bands for husbands and wives can be simple and intricately designed as well. Wedding Rings: Usually for wives, they are available in several designs. Stackable Rings: These include several different rings, which are identical in size and shape but have different colored stones. Although they can be worn alone, they are worn together, thus called as stackable rings. Mother’s Rings: In Mother’s rings, different birthstones represent her children. Thumb Rings: These are simple bands of triangular shape to be worn in thumbs. Toe Rings: Don’t neglect your feet. Wear adjustable Italian gold toe rings. Signet Rings: These have a round, oval or square shaped plain patch in the middle. Apart from these, a lot of rings of religious nature are also available. Cross rings, prayer rings and many more. You can find rings within your budget limits easily and you can be extravagant as well. The choice is yours. Rings have got an important position in our lives. Be it any occasion, ring can always make a perfect gift. From asking someone to marry you, to weddings and anniversaries all happy occasions become brighter if an elegant ring is there as a present. Italian gold rings have a special place. Their intricate designs, awesome craftsmanship, beautiful detailing all make them the darlings of all. They prove that Italian goldsmith masters are second to none. 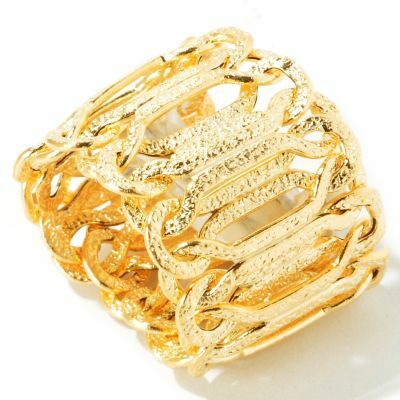 Italian gold art is as old as nearly 3,000 years, when the people of Tuscany started having an affair with gold jewelry. This love of gold jewelry making is still alive and prospering well. Today, almost 500 tons of fine gold alone are processed and used annually in Italy. Around 10,000 companies are related to the gold industry and provide for more than 40,000 people. This shows the sheer size of Italian gold industry and speaks for their expertise. Pure gold cannot be used as it is not sturdy and stable. To strengthen it, a metal base has to be combined chemically to form a gold alloy. Usually copper, nickel and silver are used as metal bases. The content of pure gold in gold alloy is measured in carats and is indicated as “k”. 24 k indicates pure gold. Different countries have different gold standards. In Europe 18 k is the standard. The same is used commonly in Italy but higher carats are used as well. For rings and bracelets, 14 carats are used more often as they are more durable.